This MRI (parasagittal FLAIR) demonstrates increased T2 signal within the posterior pairt o the internal capsule an can be tracked tae the subcortical white matter o the motor cortex, ootlinin the corticospinal tract, consistent wi the clinical diagnosis o ALS. 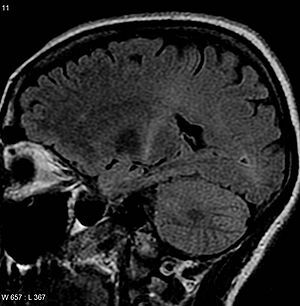 However, typically MRI imagin is unremarkable in a patient wi ALS. Amyotrophic lateral sclerosis (ALS)—an aa referred tae as motor neurone disease (MND), Charcot disease, an, in the Unitit States, Lou Gehrig's disease—is a neurodegenerative disease wi various causes. This page wis last eeditit on 20 August 2014, at 01:07.